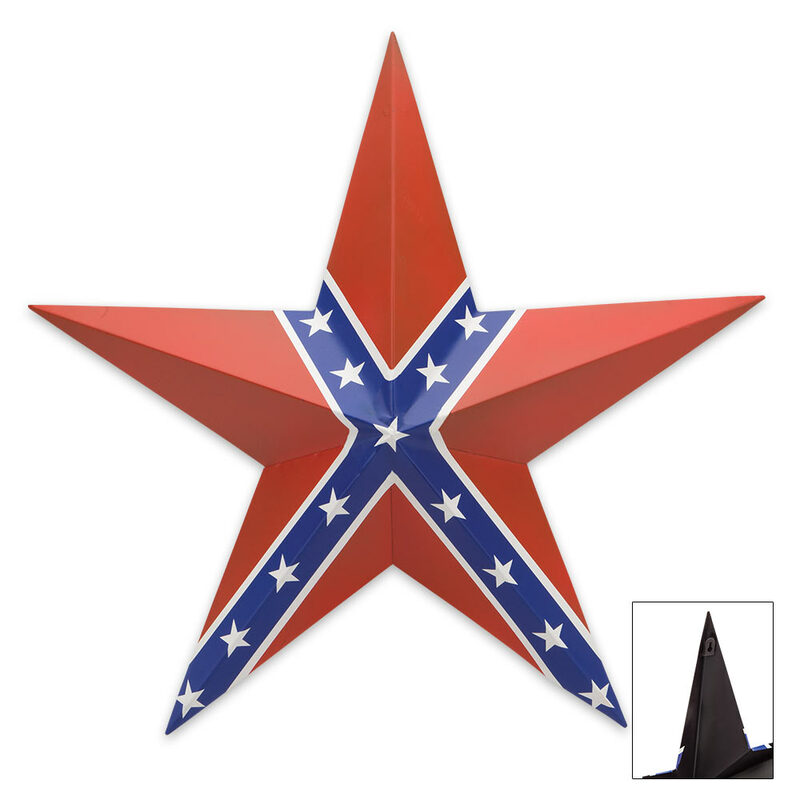 Confederate Flag Star Plaque | BUDK.com - Knives & Swords At The Lowest Prices! Boldly showcase your rebel spirit and/or southern pride with this vibrantly colored, impressively sized Confederate Flag Star Plaque. At nearly 2' tall x 2' wide, no one will miss this striking depiction of the hallowed "stars and bars," making it the perfect centerpiece for any wall decor scheme. Whether on its own or set amongst framed photographs, stuffed game or vintage metal signs, this eye-catching three dimensional star is sure to be a hit, drawing gazes and sparking lively conversation. Cast from advanced polyresin, it's extraordinarily durable and weather resistant, allowing for display in garages, porches, gazebos and other exposed areas. It's also surprisingly lightweight and easy to hang, with built-in mounting hardware on the rear. Regardless of where or how you display it, the Confederate Flag Star Plaque is an exciting, undeniably one-of-a-kind way to enrich any space and proclaim your rebel pride! It's also a unique, memorable gift for a southerner and/or rebel in your life. The star is painted Red, which has many chips. The white and blue stripes and stars are stickers which are splitting on the ridges on the arms of the star. Happy with most Bud K products but not this one.